This US-based insurance company had become increasingly reliant on email as the primary means of communicating to staff. But as the volume of email increased, message cut-through to staff dropped. Urgent or important communications were lost amidst the avalanche of emails. The only way emergency communications could be sent out was by email. This had obvious drawbacks as the message is only understood when the end user opens the email, which with severe email overload, could be hours later. “Emails became irrelevant to people. After a while they were not even reading them because there was simply far too many to efficiently process,” said the Communications Manager. Operating in multiple locations, including three office sites, one retail site and several 'work-at-home' staff, also presented a challenge for getting messages through to every staff member. To be effective, the business needed to address the problem of email overload and ensure critical communications are delivered to staff in real time. The business researched the options for internal communications tools and elected to introduce SnapComms into their workplace – recognizing the importance of both priority and reinforcement messages. Live updates to customer service staff were now possible with the SnapComms tools. In the past, call center statistics were not shown to call center agents as there was no easy way to distribute this information in a timely manner. By using desktop alerts, the call center manager was able to send out live statistics to agents indicating how they are tracking. This encouraged the agents to improve productivity if they were behind and inspired them to keep going if they were hitting their targets. Prior to rolling out the SnapComms solution, the insurance company were limited to what they could put on staff screensavers. Pushing out screensaver content to staff computers was only done once per quarter, so the ability to change what was displayed was time-consuming for the desktop team. With the SnapComms Screensaver tool, the Communications team have complete control of when screensavers are displayed, how many are displayed at once, and how they target specific screensavers to different parts of the business. Message administrators could deploy a screensaver whenever they need to, without engaging the Desktop Support team to push it out manually, making the whole process a lot more efficient. Targeting facilities of the SnapComms tools allowed the business to communicate differently with audiences by location. The company has three main office sites, plus one retail site and a number of people working remotely from home, plus subsidiary companies that receive different communications. SnapComms allows the administrator to communicate with defined groups of people separately, removing the information overload that previously existed. 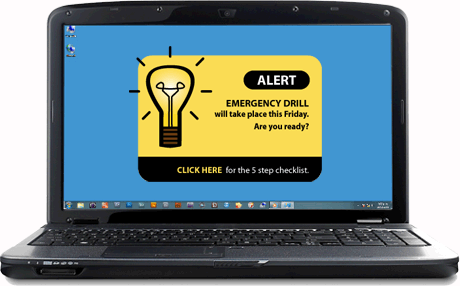 Employees know that if they receive a SnapComms Alert, the information is relevant to them, increasing readership. “The desktop support team are very happy with the SnapComms tool. Now they can send outage alerts to targeted groups immediately, and they no longer have to shut down for a day in order to push out the quarterly screensaver update,” said the Communications Manager. SnapComms has addressed the issues that were impacting staff communications at the insurance company. Important communications now get the cut-through they need in order to keep staff informed of potential issues at their location in real time. The Communications team now has the ability to run targeted internal communications campaigns without having to rely on the desktop support team. We love the SnapComms tools, we can’t speak highly enough of them!